Thirty hours into the first-ever collegiate gaming hackathon, University of Oregon Stamps Scholars Edward Szczepanski and Joseph Pilgram Yaconelli decided to scrap their project. It was a risky decision, but they wanted to create a game that was more streamlined, simpler and simply, more fun to play. Their final product, “Game Full of Animals,” uses smartphone technology to let players race to the finish. And their last minute decision paid off. 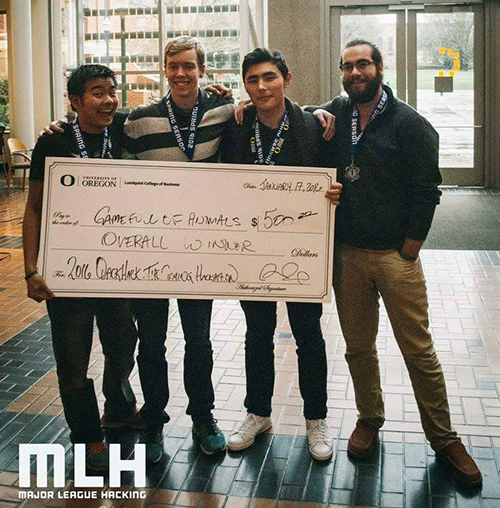 Their team, which also included Howard Lin and Sam Schooler, won the University of Oregon hosted Hackathon. Judges described the game as one of the most sophisticated and marketable according to faculty organizer Kate Harmon. In total, 118 student representing six states and 14 universities took part in the competition, which took place from Jan 17-19. Yaconelli entered the competition because he wanted to create a game reminiscent of the early Nintendo video games he loved to play as a kid. “I like making applications, but games are a lot more fun because you’re creating something that you yourself would enjoy,” said Yaconelli. But Yaconelli needed a team member who was an expert in Java. He immediately thought of Szczepanski as the two freshmen — who both study computer and information science (CIS) — bonded over computer coding. Growing up in Portland Oregon, Szczepanski developed a passion for the sciences at a young age and gained computer science experience in high school while building an app for a medical software company. Yaconelli, who is from Ashland, Oregon, always knew he wanted to be an inventor and grew as a coder while working for a restaurant menu template startup in high school. Both decided to attend the University of Oregon because of the school’s dedication to undergraduate research. It is this focus on student development and Eugene’s growing gaming industry that inspired Harmon, who also serves as the undergraduate program manager at the Lundquist Center for Entrepreneurship. It’s a sentiment that Szczepanski shares. “I really love that pressure, and it creates some wonderful things,” he said. Harmon also highlighted the competition as practice for the real world skills of budgeting time and working with the materials provided. While the event featured tech talks and video game tournaments, from the start, Szczepanski and Yaconelli ignored all distractions. They found an empty conference room, barricaded the door, and got to work. Szczepanski focused on the game’s server and programmed through libGDX, a Java framework that makes it easy to transport games to smartphones and computers. Lin was in charge of levels design and Schooler worked on the client side and network connectivity. While Yaconelli, who did the artwork, had most of his work scraped when the team redid the game, he said it was their strong collaboration that helped them win. Even before they found out the judges scores, they knew their game was a success when it was one of the most popular among Hackathon attendees. It’s a point echoed by University of Oregon CIS Senior Instructor and Hackathon judge Eric Wills. After hearing many people say they would pay for the game if it was brought to market, Szczepanski and Yaconelli decided to continue working on their project by building off the existing structure, including more complex level designs and increased player interaction. Both plan to do future hacks, possibly working with Stamps Scholars at the University of Michigan on their school’s MHack later this year. Following their win, they were also invited by engineer Daniel Seemiller to work for his company Tone Command, whose product ToneTip is an audio version of a QR code. They want to become more involved in the technology startup world, and Wills see their simple video game as a jumping off point for their career.